Roger Llewelyn was born on November 16, 1926 in Butte, Montana. 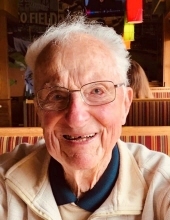 He passed away at his home in Maple Valley, Washington on April 11, 2019. Roger was the only child of Joseph and Kay Llewelyn. At the age of 17, he enlisted in the Navy and spent nearly 2 years in the South Pacific during the Second World War. After his honorable discharge he graduated from the University of Montana and started a long career with Bausch and Lomb Optical company living in Fresno, San Mateo and Carlsbad California before being transferred to Seattle in 1982. He retired in 1992. He was a resident of Maple Valley for 37 years and was an active member of the local VFW Post. Roger is survived by three children: Michael (Audrey), Joanne (Eric) Llewelyn and Lisa Llewelyn; and two grandchildren Evan and Gwynn Llewelyn. Roger was preceded in death by his wife Virginia Elaine Llewelyn in 2002. Committal Service with military honors at Tahoma National Cemetery will be held on Friday April 26th at 10 AM. The family suggests sending memorial contributions to the Regional Animal Services of King County. "Email Address" would like to share the life celebration of George Roger Llewelyn. Click on the "link" to go to share a favorite memory or leave a condolence message for the family.